BMW turned the hybrid car segment upside down when they introduced the high-performance plug-in roadster i8 for the 2014 model year. Saving the environment no longer comes at the cost of enjoying a powerful ride, and the i8 delivers in both categories. The i8 combines the efficiency of an all-electric motor, with the ultimate power of a TwinPower Turbo engine, for a driving experience unlike any other. Hailed as the most progressive sports car ever produced, the 2015 BMW i8 gives new life to the hybrid car. 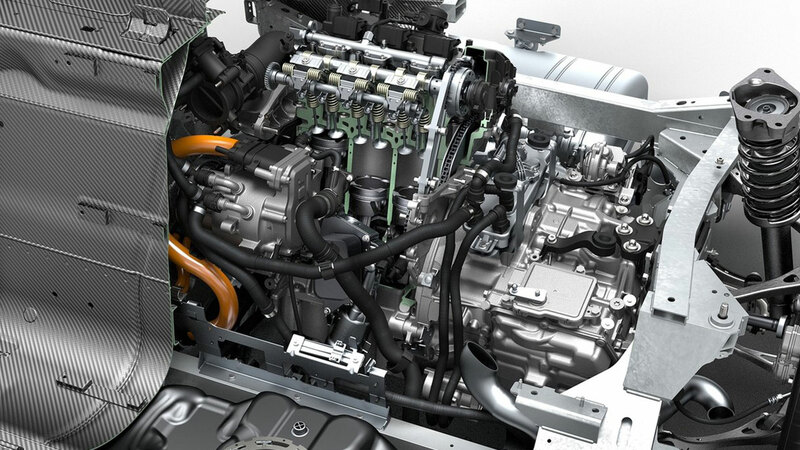 The engineering behind this efficient powerhouse is nothing short of impressive. From the combination electric-motor and gasoline-engine to the advanced technology behind each one, the i8 is a true force to be reckoned with. Exceptional standard features can be found throughout the entirety of the i8, while exclusive optional amenities are just an upgrade away. No other hybrid like it exists in today’s automotive market, making the 2015 i8 both a head turner and complete engineering marvel. As a hybrid vehicle, the 2015 i8 doesn’t just have heart it has two. The 1.5-liter TwinPower Turbo three-cylinder engine, is coupled with an innovative all electric motor, and the result is pure perfection. The two engines work in-sync to deliver unparalleled 357 horsepower and 420 lb.-ft. of torque. Drivers will bask in the uninterrupted acceleration of these powerful motors coming together, and can even go from 0 to 60 in just 4.2 seconds. This staggering number is one only achieved by BMW and has not been able to be duplicated. The all-electric motor sits on the vehicle’s front axle while the gasoline engine on the rear axle. The unique placement of each of these engines allows for a dynamic all-wheel drive system for the ultimate sports car experience. To add a level of convenience, drivers of the 2015 i8 can charge their vehicle from home with a Level 2 charging station, or at any of the 21,400 public charging stations available throughout the United States. The i8 battery on the i8 can be fully charged in a record two and a half hours, saving you time, and saving the world’s energy. Every inch of the 2015 i8 was designed for pure performance and efficiency. BMW constructed the i8 in a two-part structure composed of both aluminum, and lightweight Carbon Fiber Reinforced Plastic. Not only does this material offer a lighter alternative to steel, it also gives the i8 a more rigid frame and is made in a facility powered using the energy of water. The 2015 BMW i8 was designed to tailor to the individual needs of each driver. Featuring four driving modes, the i8 can perform on various levels, depending on road conditions, as well as the driver’s intent. COMFORT mode allows for both a sporty and efficient experience while the SPORT mode delivers an intense boost to the electric motor. The ECO PRO mode delivers the highest rate of efficiency while using both the electric and gasoline motor. Finally, the eDRIVE mode utilizes the electric motor only, offering the maximum efficiency while reaching speeds up to 75 miles per hour. The 2015 BMW i8 can achieve up to 76 MPGe fuel efficiency, far beyond any standard sports car with similar performance abilities. The 2015 BMW i8 is unlike any other car on the road. Aside from the fact that it defies the typical hybrid formula, the i8 has an outward appearance unlike any other vehicle available today. Featuring a body that is best described as “exotic,” rigid lines, aggressive stance, and large 20-inch spoke light alloy wheels, demand attention. Unique exterior color accents further the uniqueness of the i8, but the true mark of its exclusivity, comes in the way you enter and exit the car. Featuring scissor-style doors that open out and upward, the i8’s futuristic design is as incredible to look at, as it is functional. The interior of the 2015 i8 is just as impressive, packed with standard comfort, safety, and convenience features throughout. A full-color head-up display, a surround-view camera system, a 10.2-inch high definition touchscreen, and BMW’s advanced navigational system all come included in the base price. Integrated parking sensors and a collision mitigation system with pedestrian detection, also come standard on the base i8 - making it as safe as it is luxurious. Mega Carum Spice Grey leather upholstery, 6-way power front seats with heat, and a leather-wrapped steering wheel, make the cabin inviting, comfortable, and functional. Peace of mind knowing that the vehicle you drive is doing its part to preserve the environment is important, and so is the peace of mind that comes with knowing that that same vehicle will protect you and your passengers. The 2015 i8’s safety is unmatched, featuring a full suite of advanced safety technologies included. From the BMW Assist eCall feature to the impact sensor for the battery safety terminal disconnect in the event of a collision - engineers of the i8 thought of everything. The base 2015 BMW i8 comes packed with features, and comes standard with Mega Carum Spice Grey Leather upholstery. For drivers who want options, the Mega, Giga, Terra, and Pure Impulse Worlds allow for just that. Mega World - Comes with all the same standard features, and adds upgraded grey leather seats with cloth inserts. Terra World - This unique style matches brown perforated leather and similar cloth, and pairs it with contrasting blue seat belts. 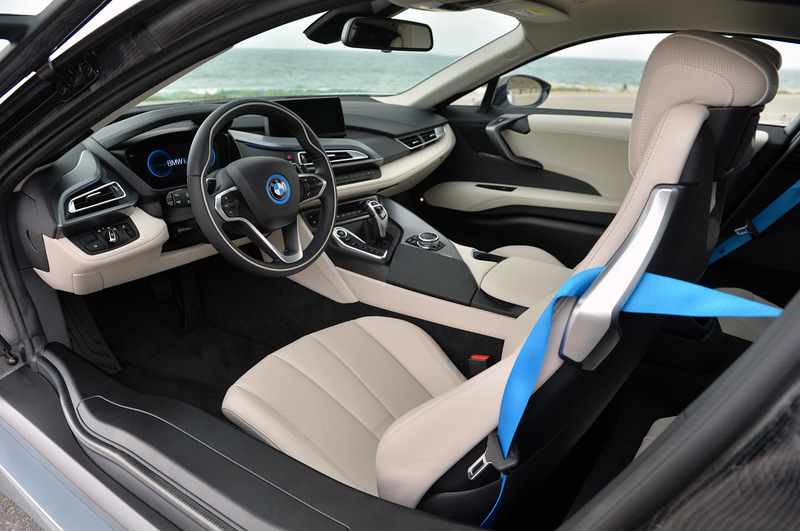 Pure Impulse World - Full perforated grey leather seating with blue seat belts, and an anthracite headliner, transforms the interior of the i8 for maximum uniqueness. If different color leather seating is not enough, drivers can opt for the exclusive Louis Vuitton Baggage Set, designed specifically for the 2015 i8. Tailor made to fit into the storage compartments and seats of the i8, this collection features two travel bags, a garment bag, and a brief case. Stitched using the same carbon fiber threads as on the i8, these bags were designed and crafted to the highest possible standards.